"An illuminating, emotionally charged, and important piece of Hollywood's hidden history." "Hunter's book has been pre-sold on his "coming out" and his two-year affair with the late Tony Perkins, during their joint early stardom. But it is no lurid kiss and tell, though he drops the names of a couple of other famous flings...Written with the help of Eddie Muller, this book neither shocks nor titillates. It is a fairly discreet, straightforward account of the rise and fall, plateau, then the rise again of a beautiful product of Hollywood's dying days in the studio contract system." One of the biggest screen idols of the 1950s speaks out about the scandals, the successes, and the sacrifices that came with being every woman's fantasy and the pin-up boy for millions of star-struck teenage girls. Art Gelien, an introverted and extremely attractive young boy, was discovered by a Hollywood agent and transformed, with the help of studio publicity hacks, into Tab Hunter, Movie Star. This book tells how it happened, and what it felt like to be created, packaged and sold to the American public. How it felt to appear on-screen, off-screen, and on every newsstand in America with the biggest leading ladies of the day—Linda Darnell, Natalie Wood, Debbie Reynolds, Lana Turner, and Rita Hayworth—while dealing with the reality of being gay in a time when the word didn't exist. 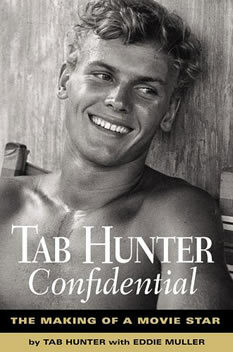 The book is the result of a two-year collaboration between Tab Hunter, now 74, and author Eddie Muller. SAYS EDDIE Tab was great to work with, completely devoid of any movie star vanity. The project came about when Tab read my profile of his friend Evelyn Keyes in Dark City Dames. He thought it was dead-on, and called to ask if I'd be interested in co-writing his story. What I appreciated was that he clearly wanted a collaborator, not a ghostwriter. And the process was delicate at times-Tab had spent so long not talking about being gay that it was a real revelation for him to discuss it so frankly. Helping somebody put their legacy down on paper is a pretty heavy responsibility, and I'm glad it all worked. Tab and Eddie on a lunch break during the writing of the actors autobiography. Tab seems fresh, Muller looks beat. This restaurant made a small fortune off the collaborators during the creation of this book.